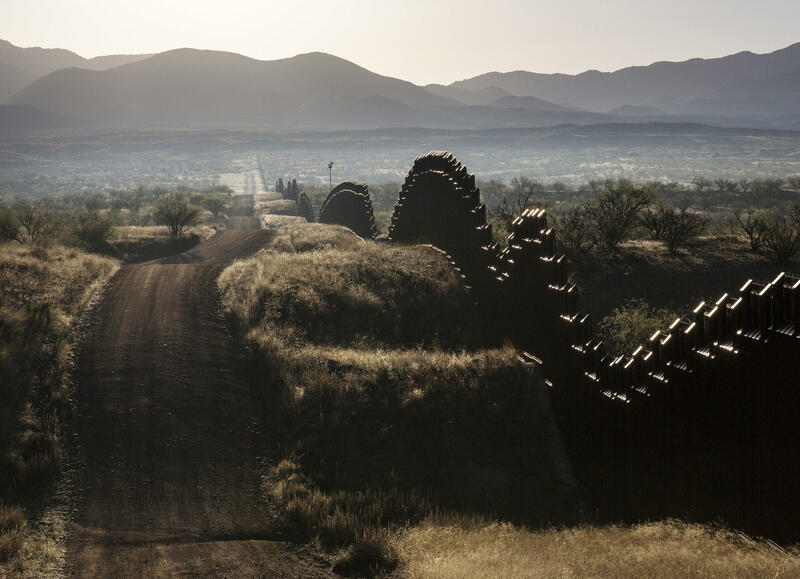 A view of the U.S.-Mexico border fence on the outskirts of Nogales, Mexico. Francisco Cantú says people always find ways up, over, under or around border fences. He says, "The first time you're thrown a set of keys, you're often sent to one of these lookout positions. And I remember, like, standing outside of my truck and just looking out at the desert on all sides of me. And I'm someone who grew up in the desert, so it's not unfamiliar to me, but I'll never forget that feeling. I felt, you know, completely overwhelmed. It was like I was looking out across the ocean. I mean, that's how vast it is." Cantú left the Border Patrol in 2012. His new memoir is called The Line Becomes a River. On encountering a middle-aged mother who was abandoned in the desert while crossing into the U.S. I remember sort of bandaging her feet and cleaning her wounds, which is this very, you know, direct, tangible way of helping someone. I think it's almost biblical, in a sense, to clean someone's feet. And I remember her looking down at me just kind of, like, very tenderly and thanking me. And I felt like, "Don't thank me. At the end of the day, I'm taking you back to a cell and I'm sending you on your way to be sent back to this place that you're literally risking your life to flee." And so, yes, it's true that the Border Patrol does good work and rescues people and saves lives, but there's tension there. In the station where I worked, we had quite a bit of border fencing — a wall. It was 20-foot-high steel mesh and, you know, guys on the south side found a way to pry open these steel panels and put a hydraulic tire jack underneath and jack them up and lift them high enough to drive cars underneath. And, you know, when that didn't work, they would show up with welders and weld holes just big enough for people to walk through or to crawl through. And so I really think, no matter what obstacle we put at the border, it's going to be subverted. People are going to find a way up, over, under or around it. If you're anywhere within 40 to 80 miles of the border, you're being watched by cartel scouts. But of course you're also being watched by the United States government. I mean, our border is one of the most heavily patrolled, surveilled terrains that there is. And so when I go out now for a hike or for a day out in the borderlands and, you know, explore some little canyon, I'm always kind of conscious of that in the back of my mind: "I wonder who's watching me right now." The standard-issue sidearm is a HK P2000 .40-caliber. And you have the option at the beginning of every shift of checking out an M4 rifle or a Remington 870 shotgun. You know, we call that a longarm and, you know, if you're a cautious, careful agent, you're usually going to check out one of those weapons from the armory before you start your shift. I'll never forget as a Border Patrol agent bringing this guy into my station, part of a group that I apprehended, and I was rolling his fingerprints and putting him into, you know, the database to be shipped back to Mexico. And I remember him just kind of like looking around while I was asking him these formulaic questions. And he's like, "Hey, I know there's a couple hours before the bus comes, is there anything that I can do? Can I take out the trash? Can I clean the cells? I want to show you that I'm here to work." It changed things for me to have someone in front of me and say that to me. And so those are the kind of things that I carry with me. I think there's nothing as powerful as an individual story, and I think we need to listen to the people who have those stories right now. Dave Blanchard and Shannon Rhoades produced and edited this interview for broadcast. Sydnee Monday and Nicole Cohen adapted for the Web. About 10 years ago, a recent college graduate named Francisco Cantu told his mother what seemed like good news. He got a job. FRANCISCO CANTU: I think she was terrified when I decided to join the Border Patrol. And I think she was also confused about why I was doing this. INSKEEP: Cantu had studied the border in school, but he wanted to understand it more deeply. He was accepted as a new agent guarding the United States southern border. And his experience offers a personal view of an issue we constantly debate. He attended the Border Patrol Academy and emerged equipped to patrol the Arizona wilderness. CANTU: What any Border Patrol agent always carries with them is a tricky bag. We call it a tricky bag. You've got binoculars. You've got the paper forms that you need to fill out in the field if you apprehend someone, five, six, seven, eight, nine different flashlights because the worst thing that could ever happen to you is to run out of light in the middle of the night somewhere. INSKEEP: Tricky bag in the car, he drove out across the desert - sometimes in a team, often alone - to look for people crossing. Cantu tells the story of his Border Patrol years in a new memoir called "The Line Becomes A River," which is one way to describe the U.S.-Mexico border. In this book, we find out why his mother was terrified, not so much by the physical danger as by a fear that her son would lose his soul. That's how she viewed the difficult work of rounding up people and deporting them from the desert. Cantu began to fear for himself when he arrested people like a middle-aged mother abandoned in the desert by her guide. He saved that border crosser's life, as agents often do. CANTU: I remember sort of bandaging her feet and cleaning her wounds, which is this very, you know, direct, tangible way of, like, helping someone. I think it's almost biblical in a sense to clean someone's feet. And I remember her looking down at me and just kind of like very tenderly and thanking me. And I felt like, don't thank me. At the end of the day, I'm taking you back to a cell. And I'm, you know, sending you on your way to be sent back to this place that you're literally risking your life to flee. And so, yes, it's true that the Border Patrol does good work and rescues people and saves lives, but there's tension there. INSKEEP: A tension that eventually caused him to quit the Border Patrol. It also gave him a perspective on this country's immigration debate. CANTU: In the station where I worked, we had quite a bit of border fencing, a wall. It was a 20-foot-high steel mesh. And, you know, guys on the south side found a way to pry open the steel panels and put a hydraulic tire jack underneath and jack them up and lift them high enough to drive cars underneath. And, you know, when that didn't work, they would show up with welders and weld holes just big enough for people to walk through or to crawl through. And so I really think no matter what obstacle we put at the border, it's going to be subverted. People are going to find a way up, over, under or around it. INSKEEP: What is it like when you're out in the desert alone in that really dry, really dangerous, really mountainous landscape? CANTU: It's funny. I actually remember one of the very first jobs that I was assigned. You know, the first time you're thrown a set of keys, you're often sent to one of these lookout positions. And I remember, like, standing outside of my truck and just looking out at the desert on all sides of me. And I'm someone who grew up in the desert, so it's not unfamiliar to me, but I'll never forget that feeling. I was - I felt, you know, completely overwhelmed. It was like I was looking out across the ocean. I mean, that's how vast it is. INSKEEP: Were people watching you as you were up there watching for them? CANTU: Yeah, absolutely. You know, if you're anywhere within 40 to 80 miles of the border, you're being watched by cartel scouts. But, of course, you're also being watched by the United States government. I mean, our border is one of the most heavily patrolled, surveilled terrains that there is. And so when I go out now, you know, for a hike or for a day out in the borderlands and, you know, explore some little canyon, I'm always kind of conscious of that in the back of my mind. I'm like, I wonder who's watching me right now? INSKEEP: So what was the effect on your soul of several years of doing this kind of work? CANTU: My biggest takeaway from the job, you know, more than, you know, any drug bust or car chase or when you arrest somebody who has a extensive criminal history and you pat yourself on the back, like, all of that was sort of insignificant. You know, I'll never forget, as a Border Patrol agent, bringing this guy into my station as part of a group that I apprehended. And I was rolling his fingerprints and putting him into, you know, the database to be shipped back to Mexico. And I remember him just kind of like looking around while I was asking him these formulaic questions. And he's like, hey, you know, I know there's a couple hours before the bus comes. Is there anything I can do? Can I take out the trash? Can I clean the cells? You know, I want to show you that I'm here to work. And I just - it changed things for me to have someone in front of me and say that to me. And so those are the kind of things that I carry with me. I think there's nothing as powerful as an individual story. And I think we need to listen to the people who have those stories right now. INSKEEP: Did he just want you to know that he wasn't a crook? CANTU: I think he wanted me to know that, but I think he also wanted to work. He saw that there were - the trash hadn't been taken out. He saw that there was sweeping that could be done. And I think he very sincerely would have liked me to hand him a broom. INSKEEP: The book is "The Line Becomes A River: Dispatches From The Border." The author is Francisco Cantu. Thank you very much. CANTU: Thank you so much. (SOUNDBITE OF RER REPETER'S "LEARNING THE ROPES") Transcript provided by NPR, Copyright NPR.